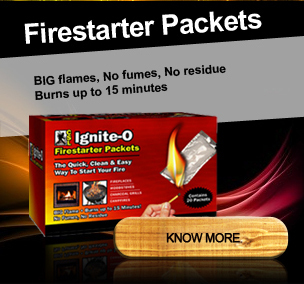 REDUCES THE WEIGHT, THICKNESS AND FLAMMABILITY OF CREOSOTE ! Recommandations / Tips to know. Can CSL be used in a pellet stove fireplace insert? Does CSL replace the need for regular chimney inspections? Can CSL be used in a 'zero clearance' fireplace? How often should my chimney be inspected? Can CSL be used in a catalytic woodstove? Is CSL as effective as using a mechanical wire brush? If I burn 2 CSL logs, will I get better results? Will I see immediate results from CSL? Some smoke coming into the room after the CSL stopped burning. Why? Can I burn a fire immediately after using CSL? 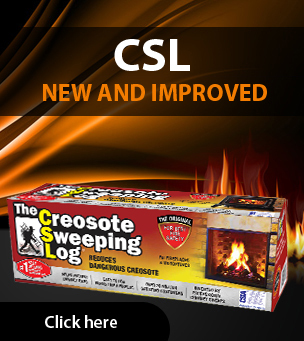 Does CSL burn hotter than a wood or standard fire log? Is CSL safe for a wood or air tight stove? My CSL did not ignite when I lit the paper. Why? I noticed that CSL smokes for quite some time. Is this normal? Can I use CSL with my gas or propane fireplace? Can CSL be used in a combination wood/oil-burning furnace? When I check 2 weeks after using CSL, I could still see black sooty material. In purchasing a Creosote Sweeping Log, you have taken a step to greatly reduce the risk of a chimney fire in your fireplace, a potential serious hazard. Each time you burn a wood fire, tar and creosote are formed and over time, this will build up on the inside of your chimney. Creosote is a highly flammable compound, which can ignite from the flames of future fires, and cause a chimney fire. The Creosote Sweeping Log contains a mixture of special minerals that are dispersed during the process of burning this product, and those minerals will coat and adhere to the creosote. A catalytic action will then start taking place, lasting up to 15 days, which will cause the creosote to become very brittle. As you use your fireplace, the heat from the fires will then cause this creosote to break away from the wall of the chimney and fall back into the fireplace, in the form of small particles. Tests have shown that the burning of a single Creosote Sweeping Log can reduce this build-up by up to 60%! Also of enormous importance, is that any remaining deposits will be much less flammable. In order for you to use this product as effectively as possible, we are listing below a serious of Questions and Answers that we hope will give you all the information you require. We thank you for making this purchase and we hope you will continue to use CSL, The creosote sweeping log as a regular chimney maintenance product. Non-corrosive, The creosote sweeping log helps you keep your chimney cleaner when used regularly. It inhibits the rate of creosote buildup and reacts with most chimney deposits to reduce the adhesiveness. Removal of creosote and deposits reduces the chance of a dangerous chimney fire. We recommend using the Creosote Sweeping Log for wood stoves, inserts, fireplaces and other wood-fired equipment. If you use your fireplace frequently, we suggest that you burn a Creosote Sweeping Log at the beginning and middle of each season, for optimum results. In case of an angled flue, it is possible that falling creosote may cause some blockage. We suggest that you carefully inspect the flue after using The Creosote Sweeping Log to ensure that it is free of debris. Dont forget, The Creosote Sweeping Log will not tell you if your chimney is blocked or has any kind of structural damage. A professional who is able to determine its condition, should always inspect it on a regular basis. No. The Creosote Sweeping Log will not tell you if your chimney is blocked or has any kind of structural damage. A professional, who is able to determine its condition, should always inspect it on a regular basis. For cleaning, it depends on the age and condition of your fireplace. The CSIA recommends annual inspection to check for blockage and structural damage. To find a certified chimney sweep in your area, visit www.csia.org/csl. CSL works through a catalytic action to remove it. If you still plan to use a mechanical cleaning device, we strongly suggest that you burn a CSL approx. 14 days prior, which will greatly improve the cleaning action, by causing the creosote to become brittle and therefore break away easily. No. This catalytic action takes place for up to 15 days. As you continue to use your fireplace, you may not even notice the remnants of the creosote as they fall and mix in with the ashes. The heat from the fires will ensure that CSL will continue to work on the buildup of dangerous deposits within your chimney, and reduce flammability. Yes, leave any CSL remains into your firebox and simply make a wood fire upon it. Yes! Simply ensure that you burn it alone or onto hot ambers (without any flames). You will want to make sure the dampers are fully open until the log has completely burned and finished smoking. Close the air intakes if you burn the CSL onot hot ambers. I noticed that CSL smokes for quite some time after the flames are out. Is this normal? Yes! This is part of the process that allows the minerals to flow up the chimney and coat the creosote. Yes! But make sure that you turn off the fuel heating system first or the treatment will not be as effective. Also ensure that you put CSL in the wood burning part of the furnace. (You can cut CSL into smaller portions if need be to fit). NO!! you cannot use the CSL in a pellet stove. Pellet stoves are intended to produce very few smokes. However, it requires regular visual inspections. Can CSL be used in a zero clearance fireplace? Yes you can use the CSL in a 'zero clearance' Fireplace. Simply follow the instruction for use. Put the catalytic converter into the inactive mode. Make a normal fire and wait for it to reach proper temperature to operate the catalytic converter properly. Put the CSL onto the hot ambers and open your stove door to bring much fresh air and oxygen as possible. Do not put the CSL on a fire with flames. Let the CSL do the job. If you have a large fireplace or an excessive build up of creosote (1/4 inch or more), then 2 logs will be more effective. For standard fireplaces and woodstoves, one log is sufficient.For large open fireplaces, we suggest to use 2 CSL at the same time . Do not put 2 CSL at the same time on hot ambers. Clean your firebox from any debries and put the 2 logs directly into it, 1 foot between each. I noticed some smoke coming into the room after the CSL stopped burning. Although this rarely occurs, it only will happen if your chimney cools too much after the flames have gone out, which may allow a downdraft, forcing air back down the chimney. This can happen with any type of fire. If this occurs, you want to get an updraft restarted so we suggest adding some newspaper to the firebox, carefully light them and the heat should start the air flow back up the chimney. To avoid this problem, we suggest you burn CSL on the hot embers following a regular fire. No. The heat from a CSL log will be much the same as a fire log will produce. Sometimes poor airflow can make it harder to start. If this happens, you can use newspapers placed underneath, to start or restart the burning process. You can also put the CSL onto hot ambers (wihtout any flames). Follow the instructions for use for further explainations. No! There is no need for using CSL in these instances and it could be hazardous. When I checked my chimney 2 weeks after using CSL, I could still see black sooty material.Did CSL not work? Yes it worked. But CSL is designed to remove the dangerous creosote that is the cause of chimney fires. It will not always remove loose dust that often forms further up the chimney. That would require a mechanical cleaning that you should consider doing when it builds up to levels that interfere with the draft of your fireplace. and have all the needed certifications. CSL is awarded the Seal of Acceptance. The CSL is a useful addition to annual professional chimney maintenance, and has been granted CSIA Accepted Product status by the Chimney Safety Institute of America (CSIA), a non-profit, educational organization with the only national chimney sweep certification program in the industry. capabilities.